I’m having a difficult time writing about this meal, because it sort of makes me want to eat it immediately. And instead, I have something else already prepped for dinner tonight. Sigh. But never mind my grumbling. YOU should eat this for dinner tonight, if only to pacify my own cravings. First you concoct an addictive spicy-sweet mixture of roasted winter squash and onions caramelized with vinegar and maple syrup(!) This is meant to be your topping, but it’s so good on its own that you’d be excused for eating half of it right out of the bowl. Then you slather some ricotta on grilled bread, add (what’s left of) your vegetable topping, and sprinkle the whole pile of deliciousness with chopped mint and salt. Oh my, now I really, really want some. Heat the oven to 450. Combine the squash, 3 tbsp olive oil, chile flakes and 2 teaspoons of salt in a bowl and toss well. Transfer the mixture to a parchment-lined baking sheet and cook, stirring once, until tender and slightly colored, about 15 minutes or a little longer. Remove from the oven. Meanwhile, heat another 3 tbsp olive oil over medium-high heat, add the onions and remaining teaspoon salt and cook, stirring frequently, until the onions are well softened and darkening, about 10-15 minutes. Add the vinegar and syrup, stir and reduce over medium-low heat until syrupy and broken down, 10-15 minutes; the mixture should be jammy. Brush the remaining olive oil over the bread slices and place on a baking sheet. Broil for about 5 minutes, until the toasts are golden and the edges crisp. 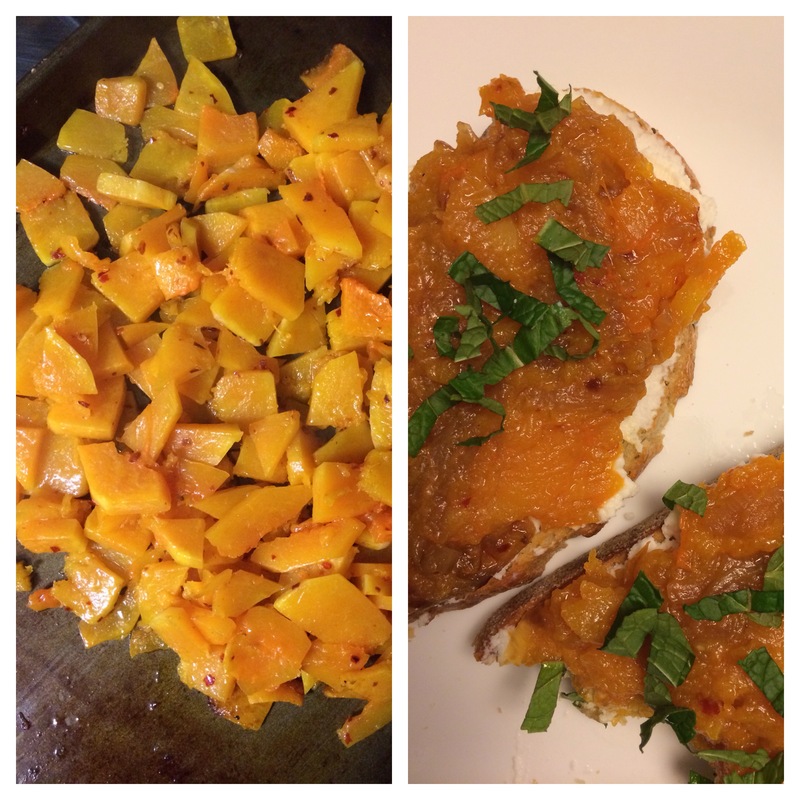 Spread ricotta cheese on toasts, then top with the squash-onion mixture. Sprinkle with coarse salt and garnish with mint.